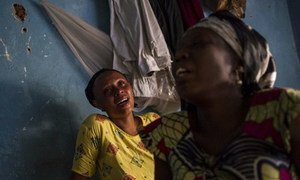 Relatives of a student killed in the Jabe neighbourhood of Bujumbura, mourn at home in the Burundian capital. The United Nations Independent Investigation in Burundi, which was set up to investigate human rights violations in the country since April 2015, said today it has completed the deployment of a team of human rights monitors on the ground. The UN Human Rights Council established the Independent Investigation team in December 2015 to investigate violations and abuses of human rights in Burundi, make recommendations on the improvement of the human rights situation, and engage in a dialogue with the authorities and other relevant actors in the ongoing crisis. “Following our first visit to Burundi in early March, the deployment of human rights monitors is a new and important step forward in our investigations, and will help us collect meaningful information on human rights violations and abuses which have been committed in Burundi since April 2015,” said Christof Heyns, Chair of the Independent Investigation. In addition to collecting information in Burundi, the team will also visit neighbouring countries, including Rwanda, Uganda, Tanzania and the Democratic Republic of the Congo. The visits to neighbouring countries will allow the human rights investigators to meet with Burundian refugees and collect testimonies from those who have fled the violence. “Now that the team is fully in place and operational, I hope that we will receive information and documentation from many individuals, groups and organizations on the human rights violations and abuses which have been taking place in Burundi since the crisis started, a year ago,” said Mr. Heyns. In addition to Mr. Heyns, the team consists of two other independent human rights experts: Maya Sahli-Fadel and Pablo de Greiff. The three experts plan to undertake a second visit to Burundi in June, and will present their final report to the 33rd session of the Human Rights Council in September 2016. The United Nations human rights chief today condemned the increasing number of attacks against high-level officials in Burundi and called for proper investigations to be carried out.